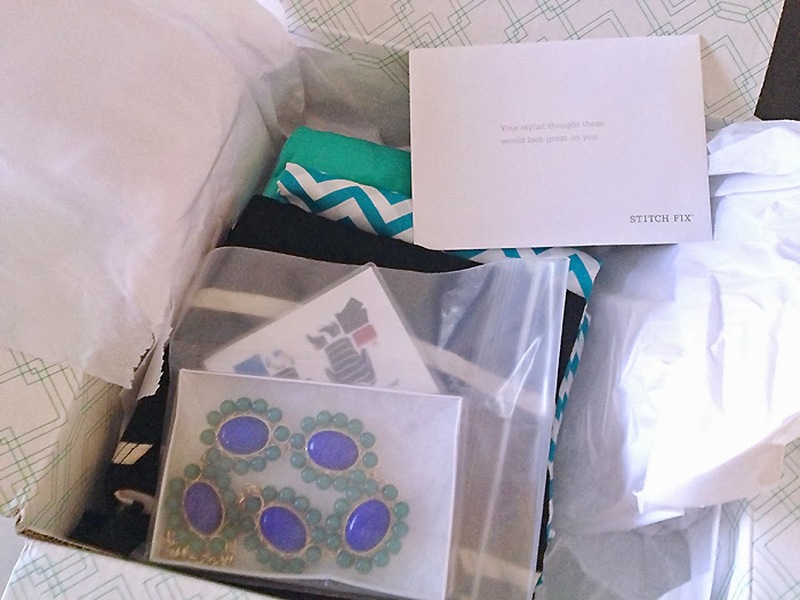 Cherish Everyday: What is Stitch Fix and what it's the box? 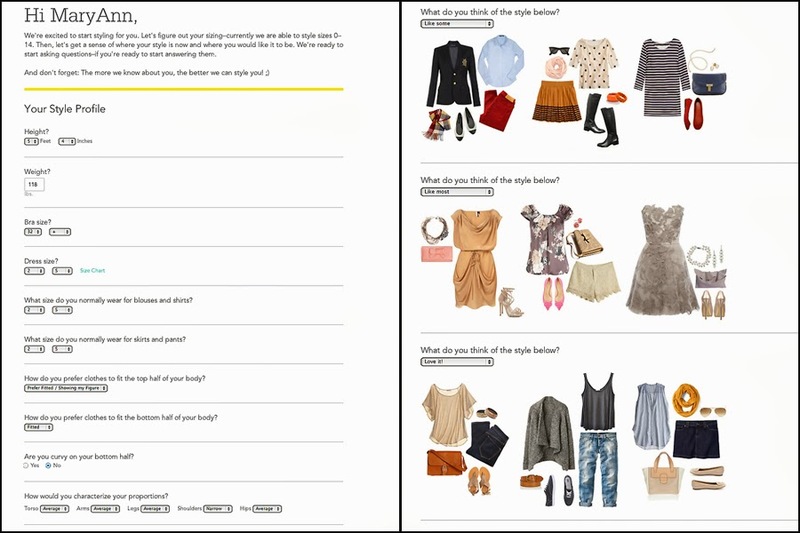 What is Stitch Fix and what it's the box? You sign up and wait until you get an invitation email (They're still a new company and take on new customers as they can handle it). I believe the current wait time is a few weeks to get an invitation. While you are waiting you can fill out a long in depth style profile. It asks for your sizes, fit, style preferences, and how far you want to be pushed out of your comfort zone. Once you receive your invitation, and your style profile is complete, you pick a date for the delivery of your first fix! Then, based off of your surveyed preferences, they pick 5 items that they think you'd love, put them in a box, and mail them right to your door step. Your package usually arrives within one day of the date you choose. Then the fun part... try on those clothes! Get some second opinions, take some pictures, post them to your Instagram account or have your Facebook friends help you decide! You have 3 days to decide what you like, don't like or love. Like it all? Awesome, keep it all and get 25% off the purchase! A few pieces that you don't like? No problem... Simply slip them in the prepaid mail envelope included and send them back. How much will you have to shell out for Stitch Fix? It's a $20 styling fee for each fix, which is then applied to the cost of anything you decide to keep. You can set your price ranges for each category - tops, bottoms, dresses, outerwear, accessories. Also, with each "fix" you are instructed to report back on each item: what you liked, what you didn't like, and then you can make some adjustments and schedule your next Fix! Make sure to update your profile frequently the best time to do this is right after your Fix when your style notes are fresh in your mind. Now, are you ready to see what I got this month? After a few blah "fixes" I was a little discouraged, so I did a little revamp of my Pinterest boards with styles I wanted to try in my monthly boxes. My stylist this month, Jenni, really paid attention to things that I pinned and even sent me a few identical pieces! From the moment I opened the box, I was giddy. The beaded necklace that I had requested, the chevron pattern, and the colors.... my stylist, Jenni was on the right track! Next up, the Renee C Jemdy Striped Dolman Sleeve Jersey Top. Another winner for me. The material is so soft and the fit is perfect. The shirt is fitted at the hips and loose at the waist. It hides the area that I'm the most self-conscious about. It's a keeper. The fifth piece in my fix was this comfy Chris & Carol Seneca Colorblock Maxi dress. I'm a firm believer that a girl can never have enough maxi dresses, especially when living in the heat of Arizona! Maxi dresses and skirts are a staple in my wardrobe and this dress is the perfect addition. I love that I can dress it up with a necklace and dressy sandals or keep it casual with flip flops. Another keeper. So what's the verdict for this month's fix? I think my stylist rocked it! If you're interested in trying Stitch Fix here's a referral link - Click here for cute clothes! These all look awesome! Maybe try belting the chevron shirt to show there is no baby bump. 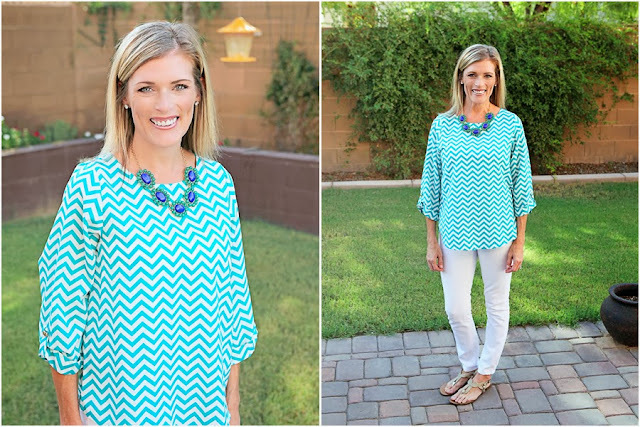 Love everything and that chevron blouse looks amazing on you, I would keep it and love the idea of belting it too. Love the idea of stitch fix, wish it was here in Australia too. Love the black top and the maxi and the chevron pattern but agree maybe another way of styling it would make it more awesome... Not sure about the plain top... Hmm if you don't love it don't get it... Well that's my policy I have to love love love things ! The necklace looks like it makes you feel really happy. Love to see more SF reviews next time you get a fix. I'm loving this idea more & more! I so need help w/the wardrobe & no time to shop! Love your pieces too!